Functio laesa?loss of function of the associated tissues. One more factor is needed to see what we do in the medical and dental professions to designate something a disease (a concept, not a fact); and, to that end we add the “symptom,” or the subjective reports on what is happening to the individual. For example one might say, after observation of a loose, swollen pus filled molar tooth, “my tooth is hurting very bad, I feel sick at my stomach ? it is throbbing?I feel dizzy and I will faint, if I don't sit down.” The latter are “symptoms,” subjective reports. Essentially, we have only two factors we deal with in diagnosis: A) “signs” (facts?observable), and B) “symptoms” (subjective observations and reports by the individual). That is it. That is the most profound, simple, awesome teaching offered at Michigan I believe, for it led me to reflections, insights and realizations later on that permitted me to be open to the fact that “ there is no such thing as disease.” Now, you and I know very well that there is such a thing as “disease.” It is self-evident! Your doctor told you that you have this disease, and, if he didn’t you took the condition he was talking about and assumed it was a disease. For example, a diagnosis of “chronic bronchitis” is normally based on the three cardinal signs of: 1) Increased shortness of breath, 2) Increased sputum volume, 3) Purulent sputum. Surely you have a disease called “chronic bronchitis” and it must be treated as such with modern medicine, surgery, or hospitalization. There are now about 17,000 known “diseases” for human beings today, documented by various sources. It is reported at the time of Buddha there were only 104 conditions. So, what are these diseases or conditions? In the 1980s Science News published an article, as I recall on “Creating A Disease.” I think that just by the name of the article you get the idea of what I’ll present. Basically what we do to “Create A Disease” is gather all the “signs” and their “symptoms”, put them down on paper (computer) and call it something like “dental caries,” “chronic bronchitis,” etc. So the end result is a “concept” of what we have identified, naming it and then mobilizing physical or mental forces to ameliorate, stop, or cure it?symptomatic treatment. Another example is how we treat symptomatically, that is, minimize the “symptoms” for what we call “dental caries” (holes in teeth), is by use oils to stop the pain, eugenol oil in the tooth, or oil pulling to minimize the pressure build up in dental areas that minimize tooth ache. What we identify as “pain” is an alert mechanism for human beings that identifies an area that is out of balance in the physical body. There is too much concentration, or decentration, in tissue pressure. Let me explain. Other forces or directionalities are variants of these, such as torque, twist, rotate, precession. Human being experience intensification of “pressure”/ “compression”/”pushing”/ “contraction”/ “concentration” as pain. Realistically, pain is an interpretation of the actions noted previously and their associated opposites that elicit a skin response (or any other tissues) we might identify as “pain” through the neuronal pressure receptors like the pacinian corpuscle. 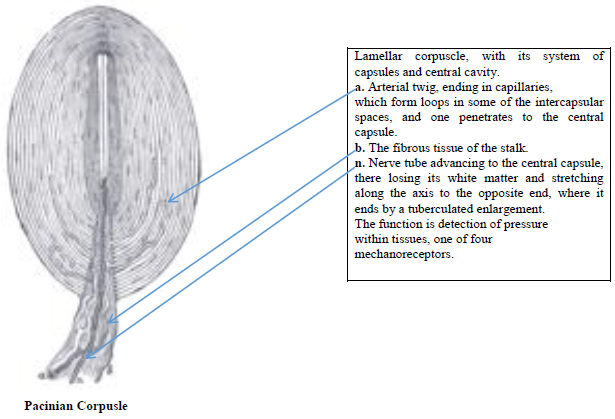 The lamellar corpuscle is designed to detect micro small changes in pressure. It does not detect “pain,” it detects pressure differentials we identify as pain if to great. Free nerve endings and Meissner’s corpuscles off a similar function of pressure detection. We are under a huge amount of atmospheric pressure, about 10,000 kg per square meter or 14.7 lbs per square inch. of skin and we don’t know this in our normal state of sensation. Our internal outward pressure counteracting this atmospheric pressure is what we call “blood pressure.” It must equal that pushing in or else we’ll compress to very little. If you hold your arm out horizontal to gravity, skin bared, it is in balance with internal pressure pushing out and external pressure pushing in. You feel nothing, is that not so? Now, take a pointed object, like a sharp pencil and place it lightly on your skin in a vertical direction to your skin (parallel with gravity) and you’ll feel a very slight pressure. Take your hand holding the pencil and press it inward, slowly, into your skin. At a certain point you’ll saw ouch, to much pressure, it’s painful and release. The opposite is so if you take a suction cup on the skin and pull skyward, ouch, too much negative pressure thus your pain. What you identify as pain is a hydraulic pressure phenomenon playing upon the nervous system. Returning to our example of skin and pressure thereon, in a normal depolarize condition there is no sensation since there is no pressure. Only when disturbed, polarized, will nerve sensors in the tissues of the human body? mechanoreceptors?work on pressure input only. 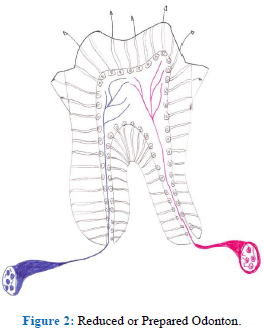 Within the dental organ is a circulatory system as roughly depicted in Figure 1. The outward flow of fluids is to the external aspect of the dental organ, Odonton, which includes its supporting tissues. 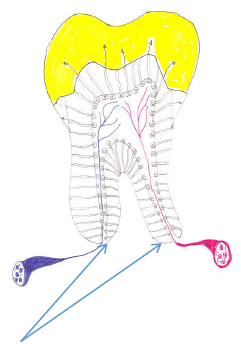 Without a deeper understanding of the mechanisms of tissue physiology, biology, chemo-electro-magnetic homeostasis, and the compelling inter-dependent relationship of these specific layers of the dental organ (tooth and supporting structures including proximal alveolar bone of its jaw segment) starting from the inward to the outward with: 1) alveolar bone, 2) periodontal ligament which contain “stem cells,” 3) cementum, 4) dentin, including it’s interstitial fluid known as dentinal fluid?dental lymph?nurturing the 5) odontoblasts, 6) type one collagen from fibroblasts within the pulp chamber, 7) and a plethora of normal dermal tissues enclosed in the pulp chamber such as lymph channels, venous and arterial channels, various nerve channels and endings, stem cells, and the normal complement of auto-immune protective cells such as lymphocytes, etc., all terminating with the 8) enamel sheath which interfaces the outward flow with the free oral environment. (Arrows in Figure 1). 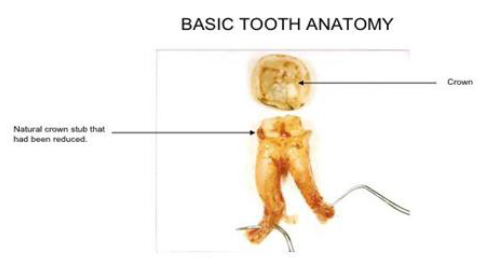 Figure 1: Normal Tooth Anatomy. Normal anatomy of a tooth with internal blood, nerve supply with the tissue fluids flowing from the jaw through the tooth’s dentin to the outside of the enamel forming a light haze (plaque or bio-film) on the tooth’s surfaces that acts as protective shield for the tooth against any enamel decomposition. What is not seen here is the bone around the roots nor the secondary nervous system surrounding the tissues below the arrows that indicate the approximate position of bone a skin attachment to the odonton. An odonton is the entire tooth, supporting attachment apparatus and the bone about that tooth holding the tooth into place in the jaw. Here we have a lower molar tooth schematically represented. 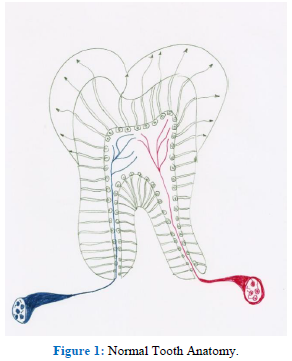 Once the odonton’s (tooth’s) “dentine-pulp” complex?indicated area between the arrows in figure 1)?is compromised with micro-organisms, or its circulatory system degenerates, irreversible events occur leading to the death of the dental organ and gangrene. In the early 20th Century the practice of “capping” or “doing a crown” for a tooth by shaving the exterior aspects into the dentine was unthinkable. However, as the art and science developed it became commonplace to “prepare” (reduce or cut away aspects of the tooth) the tooth for a full crown. (See Figure 2.) The idea of this philosophy of practice was to create a protective shield about the compromised dental organ ensuring its long life. What was not yet understood, until the early 1990s though computer analysis, was that the trauma induced to the dental organ by cutting it radically led to its death by gangrene often. The circulatory system was damaged by our attempt in saving the dental organ. The ensuing degradation of the dentine-plup complex manifested as “apical bone defects” known technically as Apical Periodontitis? inflammatory infection in the bone since outward fluid flow was disrupted. Figure 2: Reduced or Prepared Odonton. In Figure 2. we express schematically the end resutls of what is called “tooth preparation” for capping a tooth. Here all of the eamel is removed that makes space for the “gold crown” in this instant case (See figure 3). Although conceptually a means to protect the dental organ it offten kills it. From a view of biology and physiology this is an unwise move, for in essence it embalms the organ with myriad microorganisms that pontentially flow into the bone areas leading to oral system conditions such as Actiomycosis, forming mutiple body absecesses in the brain, neck, lungs and pelvic regions. Figure 3: The “Gold Capped” Odonton. The tumors are protective devices prohibiting, as much as possible, the systemic dissemination of toxins. Yet, in time they become a focus of corruption needing remedial actions. In Figure 4. we see the end result of a capped tooth and the abscesses present at the root ends that were imbedded in the bone attachment of the lower jaw. The person who had this situation felt no pain, but what she called intermittent tenderness. Upon further inspection and her dental history a pus sack in which an apical periodontitis was evident. The main body of the molar tooth separated from the "porcelain crown". The inside of the crown can be readily observed and the cut stub of the crown of the tooth shows the extent to which the tooth must be shaved to make a conventional crown, This trauma often causes an "irreversible gangrenous pulpitis." Figure 4: Abscessed Human Capped Odonton. One of the primary micro-organisms resident in the pus sacs at the root tip end as seen in Figure 4. is actinomyces odontolyticus, a fungus like bacteria that avoids oxygen and once disseminated into the vascular system can easily locate (focate) in the brain, facial and neck area, lungs, abdomen, and pelvic region to establish colonies that generate abscesses in those tissues. The condition is “Actinomycosis”  and is more prevalent than reported due to the fact that testing for it in the laboratory cannot easily identify this type of bacteria. The flora in a dead tooth of a recently “root canaled tooth” are numerous and work together to “cleanse” the tissue by decomposing it . This “cleansing” process is first by liquefaction, then gas production, and finally phagocytosis (cellular eating of the toxic tissues). But the ultimate “cleanser” is God’s Divine Light and secondly the dental surgeon who wisely removes this source of poison and its boney defect with cavitation surgery . Smergo RA, et al. Actinomycosis. Clinical Infectious Disease (1998). Nair PNR. Pathogenisis of Apical Periodontitis and The Causes of Endodontic Failures, Crit Rev Oral Biol Med 15 (2004): 348-381. Carlson RS. Endodontic-Endotoxemia: Our Current Dilemma. IABDM.